Summer in the City. If you’re lucky enough to visit NYC on a summer weekend, you will want to spend some time in one of the most incredible city parks in the world – Central Park! 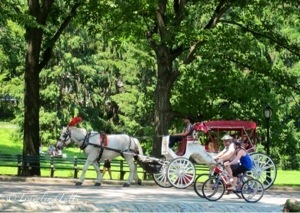 Central Park was the first landscaped public park in the United States. Its 843 acres include playing fields, gardens, boating areas, a zoo, and an abundance of natural park settings. Joggers and bicyclists will have lots of company on the six mile paved circuit. There are restaurants and concession stands to find a bite to eat. The summer months offer Shakespeare in the Park and outdoor concerts. There’s even a marionette theater with productions that will appeal to kids and adults alike. The park is so large and so seemingly natural that it’s often a surprise to see skyscrapers peeking over the tops of trees. We visited on an especially hot weekend and decided to skip to heat-radiating pavements entirely. We started the day with a walk through Strawberry Fields. This area, just across for the famous Dakota building at W. 72nd St., is dedicated to John Lennon. 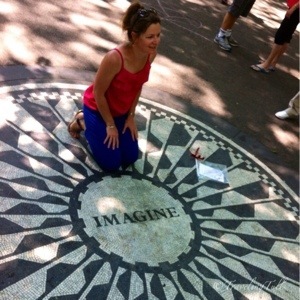 A mosaic with the word “Imagine” is the centerpiece of this area and a favorite for tourists. Expect to find at least one musician in the area playing a favorite Beatles song. We decided to rent bikes and found several options close to our Upper West Side lodging. NYC has recently instituted the City Bike program but we chose to find a bike at the Bike and Roll stand by Tavern On The Green. Bikes can be rented by the hour or for the day. Helmets and child seats are also available. 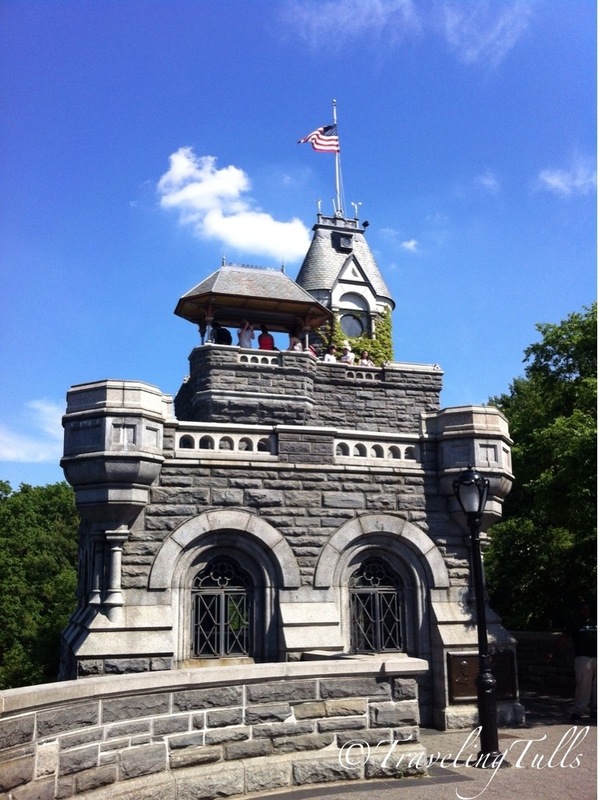 We circled the park, stopping to enjoy Bethesda Terrace and the lake. As we’ve visited before we didn’t stop for all the attractions. A first timer should stop for the Alice In Wonderland statue. It’s here that you’ll find the model sailboats sailing the Conservatory Water. A short distance away you can enjoy lunch at the Boathouse. Next up comes the spectacular edifice of the Metropolitan Museum of Art. From the road you can see into the gallery that houses the Egyptian Temple of Dendur, a gift from the people of Egypt for the U.S. help in moving monuments threatened by rising waters after the damming of the Nile at Aswan.Riding is only allowed on the paved roads so we walked our bikes for a while to explore. The Great Lawn was packed with city dwellers enjoying the day. We wandered over to Delacorte theater and found a bit of shade for lunch. Hot dogs, hamburgers and a cold drink were just what we needed! We wandered through Shakespeare’s Garden and up to Belvedere Castle. We enjoyed the view and headed back down to our bikes. Sunday morning we thought about shopping, and sightseeing but opted instead for another day in the Park. We stopped at one of the ubiquitous NYC delis and picked up sandwiches. Then back to the park to stake out our spot. 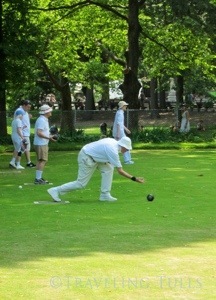 We settled next to the Bowling and Croquet Greens where we watched the traditionally clad participants enjoying a Sunday morning tournament. We’d brought our own guitar today so we sat back enjoyed the music and people watched. A perfect weekend in the city! Posted on June 3, 2013 March 10, 2019 by TravelingTullsPosted in New York City, United StatesTagged biking, NYC.